The most eye-catching element in Robert Wylkynson’s Salve Regina (to be found in the Eton Choirbook) are the nine names of the medieval angel hierarchy attached to the nine voices of the motet. It seemed obvious to use that in my arrangement for Spectra Ensemble. But things went altogether differently. I almost immediately recognized a parallel between my arrangement-to-be and Wylkynson’s use of the Gregorian chant Assumpta est Maria as cantus firmus, in the slow moving notes by the tenor. For my part, I decided to use Wylkynson’s motet as a cantus firmus: I squashed his nine-part counterpoint, stretched it out in time and gave the result to the vibraphone. To complete this process of turning Wylkynson inside out, I took the Gregorian melody and made it into the polyphony of my piece. The result, Lines & Arcs, is a nearly stationary music, consisting of slowly shifting fields. 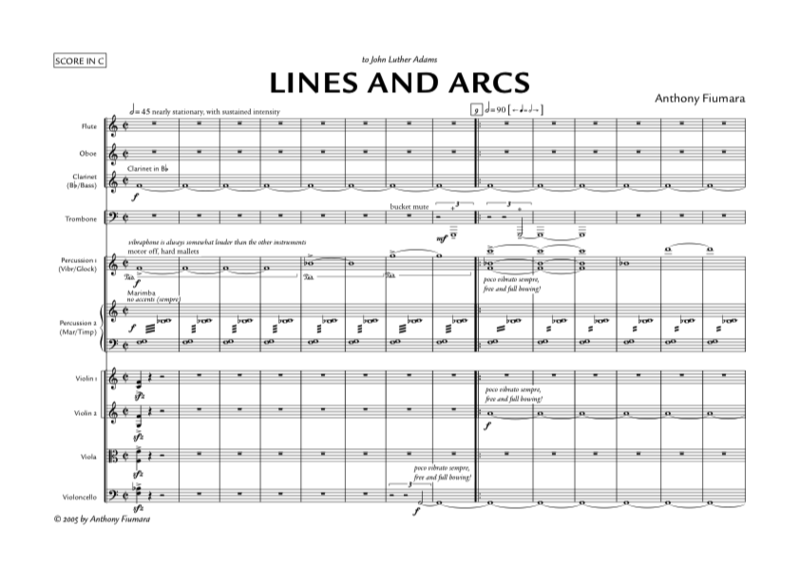 Lines and Arcs is a small homage to composer and inspirator John Luther Adams. The title is borrowed from a wall drawing plan by Sol LeWitt – because in the end, Lines & Arcs is more about patterns, superpositions and canvas than about Wylkynson, or his hierarchy of angels. Commissioned by Festival Musica Sacra, Maastricht. September 18, 2005, Musica Sacra Maastricht, by Spectra Ensemble & Filip Rathé (conductor).